""Is your strategy a filter or a bucket?" 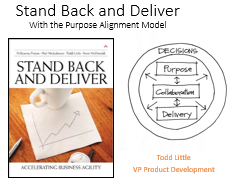 I often see teams struggle with aligning their development approaches with the market strategy of how their product is going to be successful in the marketplace. To be successful, a product must do something really well that solves a particular set of problems that customers are willing to pay for while at the same time it needs to solve other basic problems no worse than the competition. 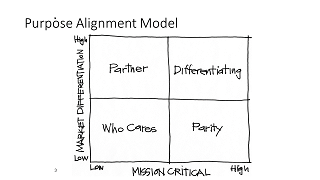 Product teams need to know where they are aiming to be “differentiating” and where they are aiming to be “good enough.” The Purpose Alignment Model developed by Niel Nickolaisen is a simple tool that can provide guidance to teams. 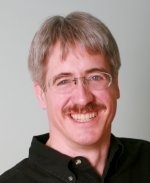 Niel suggests looking at a 2×2 matrix, with the Y –axis indicating where you aiming to have true market differentiation (high) or where differentiation is either not possible or simply not a focus of the organization (low). 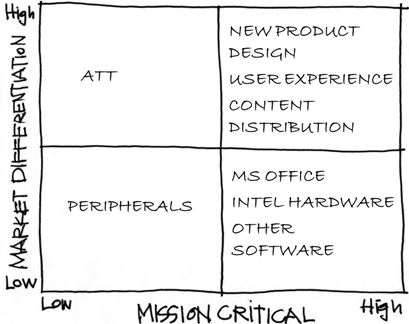 The X-axis asks how Mission Critical it is. Those items which are Highly differentiated in the market and which are Mission Critical are Differentiating for the organizations. There are items which are Mission Critical, but which do not differentiate from the competition. For those items we say we aim for Parity with the competition. Some items may not be Mission Critical for the organization to own, but still create differentiation in the market place. For those items we can look to Partner with someone to create an overall differentiated offering. Lastly, there are items which are neither Differentiating nor Mission Critical. We need to ask ourselves why these are even being considered. We call these items Who Cares and challenge proponents of these features to justify the movement into one of the other quadrants. Apple has always prided itself on its ability to come up with new products that emphasize design and overall user experience. These are areas where they have consistently excelled. Over time they got into content distribution with iTunes and the App Store. These as well provided them with differentiation. While in the early days Apple was based on Motorola chips, over time they realized that they were no longer differentiated and actually behind the market. First they recognized a need to have Microsoft Office on the Apple platform and made an arrangement to be on par with Windows. Similarly they made the switch to Intel hardware as well to keep up. In the early days of the iPhone Apple knew that they had a competitive differentiator but also saw an opportunity to create a differentiated partnership with ATT. Apple had no need or ability to have their own cellular network, but created a differentiated partnership that provided value to both Apple and ATT. Do you know how your product is differentiated in the market? Are you treating some features as though they are differentiated but just need to be at parity? 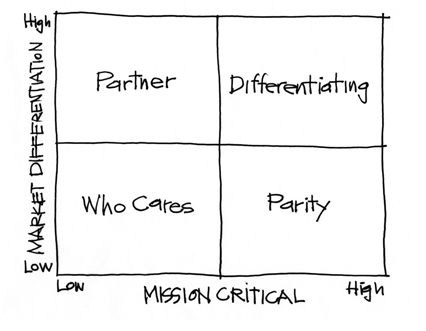 Are you working on features that are really neither differentiated nor mission critical?